Emmy was a good girl – too good, perhaps. The rat, whose cage sat on the counter next to Emmy’s desk, was not so good. On the other hand, he was the only one in Emmy’s class who would talk to her. The rest of the kids barely knew she existed. Even her teacher didn’t seem to know she was there! Only her nanny, the lovely-but-sinister Miss Barmy, really pays her much attention. And Emmy would rather she wouldn’t . . .
Why does the rat talk to Emmy and no one else? Why do Emmy’s schoolmates barely notice she exists? And what is Miss Barmy really after? Teasing out the answers to these questions will plunge Emmy into a wild adventure where everything she holds dear – including her parents’ lives! – is at risk. This delightful and hilarious book garnered four starred reviews – and has an all star cast! 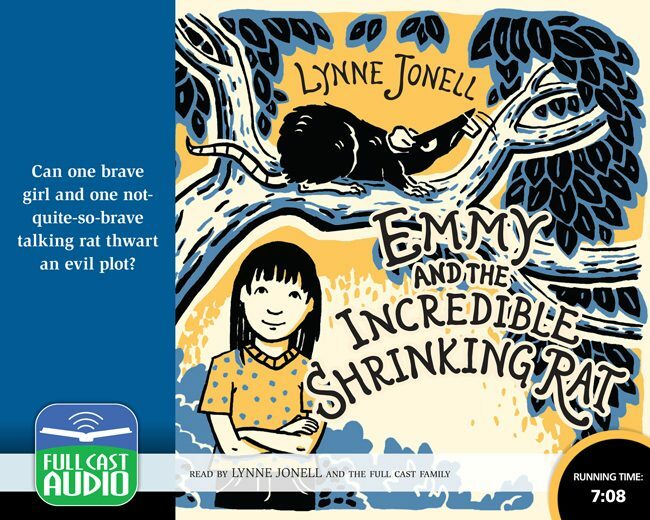 Not only did we bring in author Lynne Jonell to narrate, father and daughter team Tate and Tim Green (yes, the same Tim Green who is the bestselling author of FOOTBALL HERO) play Emmy and the Rat. We had a blast recording this one, and it’s guaranteed listening fun.